America is not the only place where political leaders prove to be far from leaders as well as poor politicians. Here in the UK, there's a long list from which to choose. Some people idolise Margaret Thatcher, whilst others consign her to the dustbin for the all the woes of modern life. Dear old Winston Churchill won the Second Word War single handed whilst writing the most detailed, balanced history of Britain, yet is a demon for his racism, genocide, concentration camps, and ill-fated military campaigns. I thought long about picking five who showed zealous ineptitude in equal measure with tragic misreadings of events that led them to choose failure and ignominy. Here, in chronological order, are my winners of the PM prize for personal and national calamity. North, whose parentage was always in doubt, came to power at a time of expansion of the Empire. He formed a government of opposites and managed to keep turbulence under the surface by patronage and favour. The main problem, however, was not at home but in the colony of America. North single handedly brought about the war of independence by the imposition of extra taxes. The Boston activists upset boats in the harbour, spilling tons of tea arriving for import, the famous Boston Tea Party. North's reaction was immediate and severe. The Coercive Acts, dubbed the Inoperable Acts by the colonists, aimed to remove legislative power and trade. This move backfired, inflaming the colonists, leading to a conflict for which North had no enthusiasm. No taxation without representation was the cry. The French joined the rebelling colonists followed by the Spanish. British defeat was inevitable. Struggling for manpower in the Army, North repealed the Act forbidding Catholics from serving. This caused dissent at home and it was only a matter of time before a motion of no confidence was passed bringing an abrupt end to his tenure and his government. America was lost, his party was in disarray, and the British Empire became an international laughing stock. No wonder George III went mad. Educated at Harrow and Cambridge, you would expect Percival to be a clever politician. His experience as a barrister counted for nothing in the cut and thrust following his promotion to Prime Minister from Chancellor in Portland's failing premiership. George III had episodes of madness during which the issue of a regency was raised. Percival resisted this, with evidence of the Prince of Wales' profligacy and dissipation. The real reason was that Percival was a Tory, whilst the Prince was known to favour the Whigs. The Industrial Revolution was in full swing, people moved from the countryside to the towns to join in the jamboree. Workers wanted recognition. Spencer Percival was the only British PM to be assassinated in office. His three years brought infighting, weak government, and riots in the streets. Percival's government was characterised by draconian measures taken against hungry rioters and oppressed workers. In 1812, at the height of Napoleon's doomed assault on Russia, Spencer Percival was gunned down in the House of Commons Lobby by John Bellingham, a Liverpool trader, who opposed government policy. Despite patronage from his father, and becoming a qualified accountant, Neville Chamberlain managed to lose a fortune managing a sisal plantation in the Bahamas. Later business ventures were more successful. 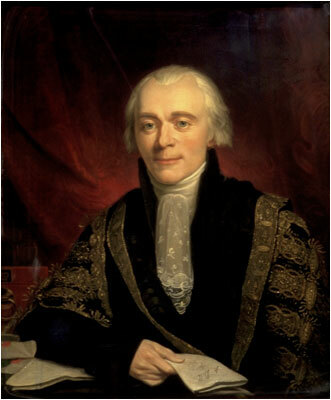 Chamberlain was busy in civic affairs in his native Birmingham, remembered for town planning and a spell as Lord Mayor. He was also noted for being a lacklustre person with little ambition. 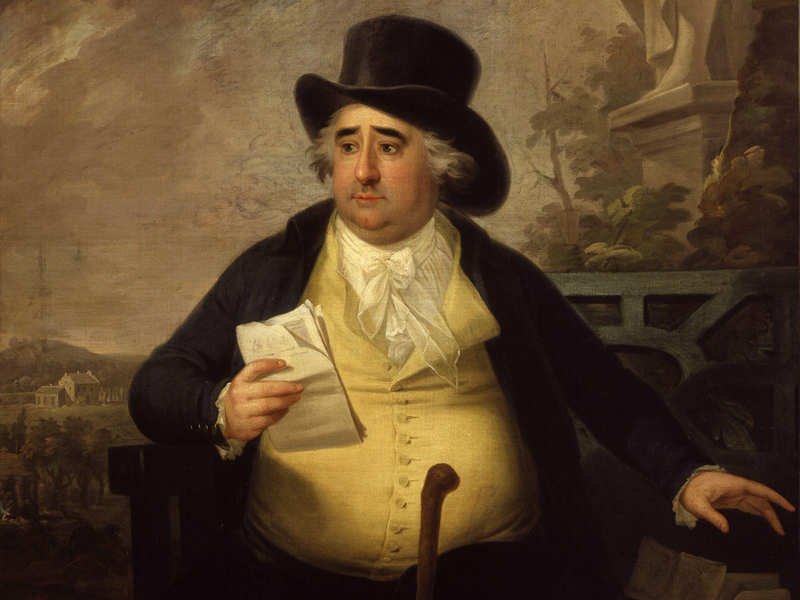 He entered parliament at age 49, throwing himself headlong into the committees and boredom on offer. He was briefly a junior at the Health Ministry, but later rose to Chancellor under both Baldwin and MacDonald. He was propelled into premiership following Baldwin's post abdication resignation. 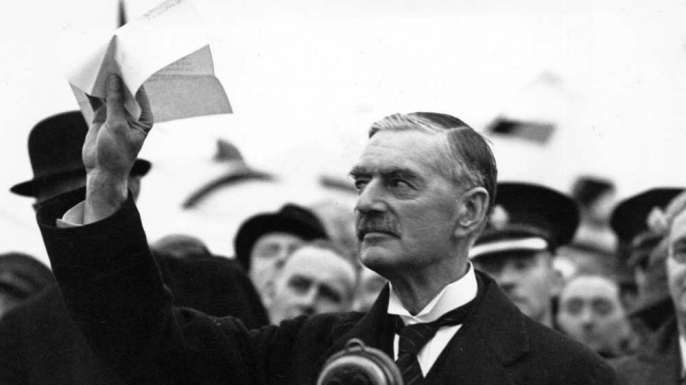 Chamberlain's take on foreign policy was to urge everyone that Nazi Germany should become a stable part of Europe. The thunder clouds were gathering as Hitler gained more power. Germany was re-arming in contravention of the Treaty of Versailles. Chamberlain was either blind to this, or thought that his charisma, shining like a bowl of porridge, would keep Adolf in check. In 1938 he attended a meeting in Munich where he agreed to allow Germany to annexe Sudetenland, part of Czechoslovakia, in exchange for peace and quiet. There can be few people who have not seen him waving his piece of paper from the windy aeroplane steps, promising, "Peace in our time." As we all know, Hitler was not about to put his toys back in the box. The following year he invaded Bohemia and Moravia as a prelude to a full scale attack on Poland. Chamberlain declared war. Did he think that would stop Hitler in his tracks? Did he order massive munitions manufacture? Did he set the country on a war footing? Dreary Chamberlain did none of that. He tried to form a coalition war cabinet but failed. He brought Winston Churchill back into the government, recognising that he needed some gumption. Chamberlain's dithering enraged other parliamentarians. He won a vote in May 1940 with a slim majority, where he should have commanded an excess of 200. He was pushed into resignation the following day so that Churchill could take over. Leo Amery, quoting Oliver Cromwell, said, "You have sat here too long for any good you are doing. Depart, I say, and let us have done with you. In the name of God, go!" 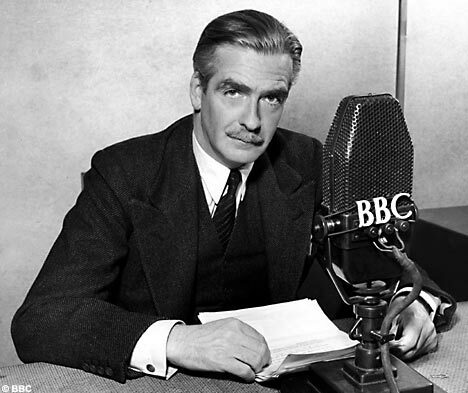 With his debonair looks and dapper dress, Anthony Eden was popular even before he showed his policies. He opposed the attempts at appeasing Hitler and Mussolini, gaining a reputation as a skilled diplomat. Eden took over the Tory party and premiership when Churchill resigned in 1955. He won the immediate election with an increased majority. The new PM had a forté for foreign policy, leaving domestic and financial affairs to others. So it is surprising that it was matters abroad that so wrong footed him. Nasser, president of Egypt, nationalised the oil refineries and canal at Suez. This had long been a French and British concern, since it was built by Ferdinand de Lesseps in 1856 to be open for all nations. Britain also had interests in other parts of the Middle East. To lose control of the Suez Canal would spell disaster for trade, especially oil. To Eden it was a no brainer to form an expeditionary force with France and Israel to retake the canal and topple Nasser. He misread the situation from the start, getting himself in more hot water by relying on American support that was not forthcoming. Eisenhower, the US President, was in de-colonisation mode, especially towards Israel. The Suez expedition ran out of steam so Eden ordered a humiliating withdrawal followed by some dirty deals with Nasser regarding guaranteed future oil purchases by Britain. He thought that this was a trivial matter because he was working in secret to assassinate the Egyptian president, but the plot failed. Eden made the further mistake of going on holiday at the end of all of this. During his absence Harold Macmillan and Rab Butler formed a powerful movement in the Tory party to oust him. When he returned from Holiday there was silence in the House when Eden resumed his seat. He resigned shortly afterwards, a move hastened by his ill health. By dogma, intrigue, and tub thumping, all out of character, he had wrought a humiliation on his country and himself. There was no way back from Suez for Anthony Eden. 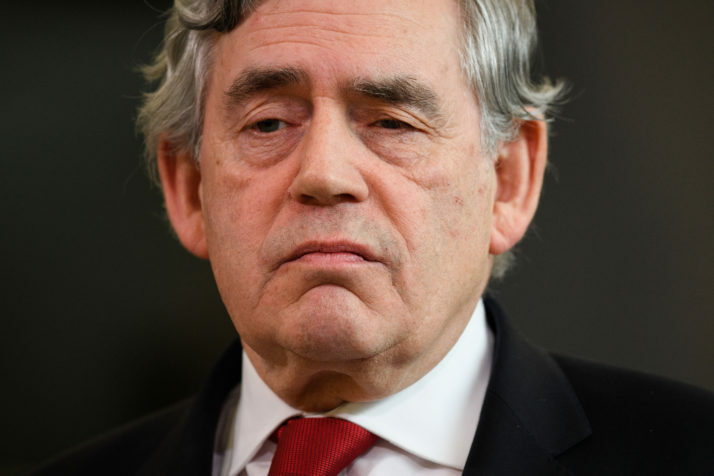 Gordon Brown was part architect of the New Labour government of Tony Blair that swept into power in 1997 as an alternative to the scandal-ridden Tory rule of John Major. It is often said that oppositions do not win elections they are lost by incompetent governments. Tony and Gordon worked a magic of deception. Appearing to be progressive and fresh on the surface, they were Tory to their roots. Tony and Gordon became more argumentative towards each other as time passed. By the end of Tony's tenure they were barely speaking to each other. After years of trying to be Prime Minister, once he took over he seemed lost. This was not helped by an international money crisis triggered by silly American mortgages. Brown was hampered by his character. From the outside it looked a bit like Asperger's Syndrome, a sort of gauche intelligence on the autism spectrum. He had flashes of brilliance in private, but was unable to understand what makes other people tick. He promised everyone to hold a referendum on the Lisbon Treaty, a fixing of benefits and responsibilities within the European Community. However, he backtracked on this, saying that the treaty was not so different from what went before, then later that it was far too complicated for ordinary people to understand. Brown was stubborn once he had formed an opinion. He refused to listen to others, pushing aside those who tried to show him valid evidence. He was convinced that cannabis was a lethal drug. When the chairman of the Advisory Council on the Misuse of Drugs, a government body, Professor David Nutt, showed that not only was this false, but also Brown's insistence on reclassifying it as more dangerous was wrong, he was ousted from his position for daring to contradict the PM. Wearing a radio microphone for TV appearances can be a tricky affair. You clip it on and soon forget about it. This happened during the ill-fated 2010 general election. Brown was being filmed during his "meet the public" outing when he met Gillian Duffy in Rochdale. She challenged Brown to say that he would promise to reduce the deficit, a promise that Brown squirmed over. He tried to charm her, but when he returned to his car the mike picked up his comment. "That was a disaster. They should never have put me with that woman. Whose idea was that? Ridiculous." Asked what she had said, he replied: "Everything, she was just a bigoted woman." At that moment the election was lost. Gordon Brown continued in denial for a few days after the election, refusing to come out of Number Ten, but at last had to concede to David Cameron's Tory and Liberal coalition. Flash Gordon's intransigence, temper tantrums, lack of empathy, and social dysfunction brought the period of New Labour to an end, and his decades of ambition crashing down. A booby prize must go to the Duke of Wellington for his pompous disdain of ordinary people - he was even too high and mighty to live in Downing Street - as well as his irrational fear of the French. Another dishonourable mention must be given to Arthur Balfour, who came into office on a tidal wave of Tory support, only to fritter it away to nothing, losing his own seat as well as the election; a first in history. He is remembered for his cobbled compromise to establish a cuddly coexistence of Jews and Arabs in the Middle East. My final accolade for a PM who couldn't even make the top five dimwits, is Sir Alec Douglas-Home (pronounced Hume). He was a tweedy aristocrat who renounced his peerage, was parachuted into the safe seat of Kinross, then took over from Macmillan. He bumbled and stumbled, cut off at every move by the much more adept Harold Wilson, leader of the opposition. Home said his problems were of two sorts, "The political ones are insoluble and the economic ones are incomprehensible." So, you can see that America does not hold the monopoly for daft leaders, although the profundity of that present ineptitude is hard to beat. Maybe the next one will be better. You can depend on Americans to do the right thing when they have exhausted every other possibility.